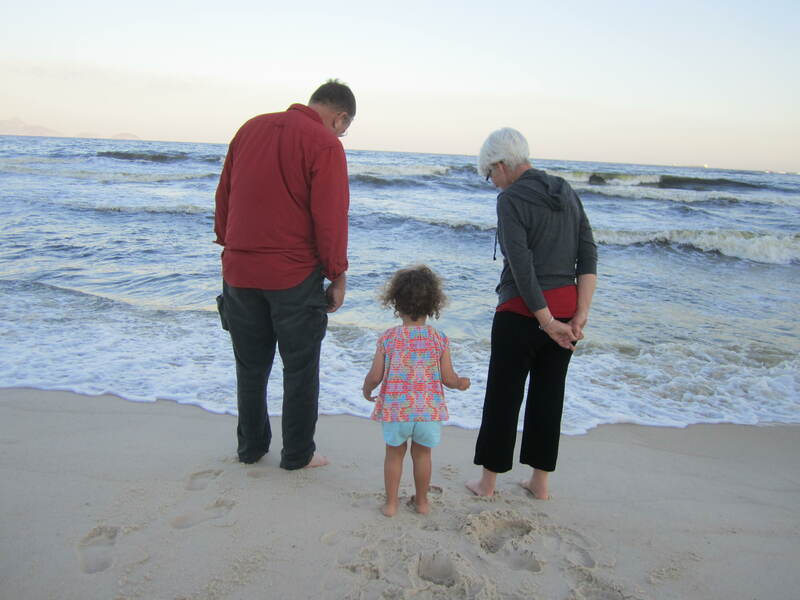 For most moms it is hard to keep up with your own mom, but for me it is nearly impossible. She is the most active person I know. Other than spoiling me to death during her two month visit, cleaning my kitchen and doing all our laundry, she gets up every morning at 4:30 a.m., has walked nearly all of Rio, and has been volunteering twice a week at daycare and school in the nearby favela of Cantagalo called Meninos Solar da Luz. And, to top it off, this is what a normal day with grandma looks like around here. Note: Christmas ornaments made of salt-based dough don’t work in Rio. It is so humid that even after being baked they just get soft. Too bad as they were so pretty. Last week when we were at the Lagoa we saw the stilt dancers advertising for a large fair featuring products from rural areas across Brazil. We decided to go, in part hoping to see the performers again. Brasil Rural Contemporaneo featured hundreds of associations and cooperatives from all over the country and while we didn’t find our stilt dancers, we were not disappointed. The products were amazing, handicrafts from every region, sweets, cheeses, cachacas, pastas, and meats. Each tent featured a region and they had special areas for cheeses and cachacas. The food court features typical food from each region and best of all they had a great kids area with playground equipment, a library and a performance area. They had not started the concert line up when we were there but as we were leaving we could hear the music. The fair was everything I ever hoped Ipanema’s hippie fair could be. The products were typical of each area but original in their designs. The vendors were friendly and the prices were great. I would go again just to get cheese. (L stopped eating cheese when we got to Brazil but when she tried some of the cheese featured at the fair she kept asking for more). The fair is only this weekend at Marina da Glória. There isn’t any parking there so we opted for the metro to Glória and it was just a five minute walk, though they do have free transportation from some parking establishments. We spent a long time there. We shopped the tents and exhausted our money. L read, played, made a collage, and found a new friend. We left just in time to make it to Ipanema for Thanksgiving dinner. We didn’t really plan to celebrate given that we leave early tomorrow morning for Ilha Grande, but Gringo Cafe had turkey and dressing and even managed to whip up a vegetarian option for me. Everyone was in the spirit of Thanksgiving and we met new friends while giving thanks for the old. Not so bad for our first Thanksgiving abroad. Best of all, we didn’t have to slave the day away in the kitchen and nobody asked us to do dishes. Last weekend we were wandering along Copacabana beach and came along a slacklining competition. We camped out and watched for an hour while L played in the sand. Later she managed to convince the people there to let her walk along the line. They tried to convince me, but I knew better. I gave it a try in Egypt and knew the limits of my coordination. 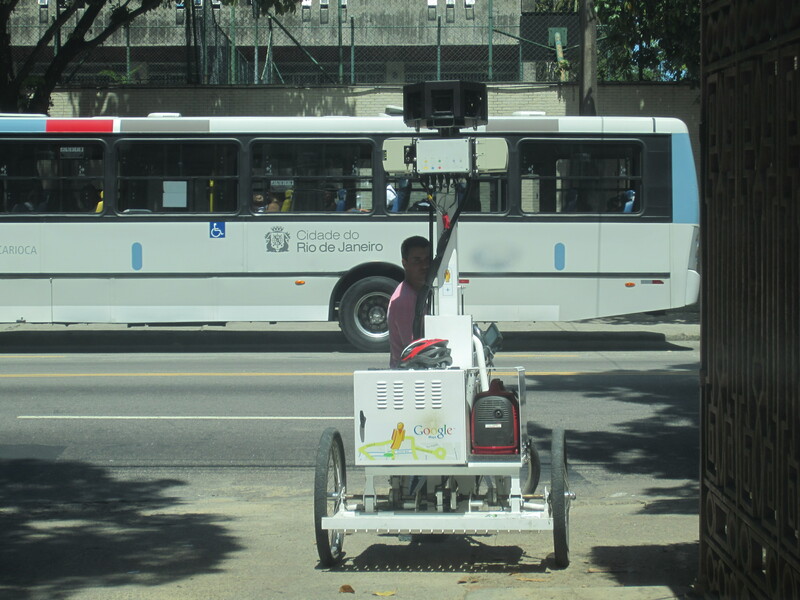 In Rio, the suburbs do not have the same connotation as they do in the States. Here suburbs are poorer, less developed areas, many of which are considered favelas, or slums. But there is an area south of Rio de Janeiro that fits the profile of an American suburb. Barra de Tijuca feels like you are driving into Florida, an area of urban sprawl, condominiums, and single family homes littered with malls and elaborate shopping centers. It is there you will find Walmart and Cosco. It is cleaner and a bit safer than the city, but for what you get in safety you pay for in traffic. When we moved to Rio we debated between living in Barra and living in the city. We had three days to find an apartment and trying to choose between the two was like comparing apples and oranges. In Barra we had cousins, the condos had swimming pools, fitness centers and play areas. There it was quiet and we would have more space. Looking in Zona Sul (Copacabana and Ipanema), we were looking at less space, more expensive apartments with none of the perks, in more crowded, dirty areas. We went back and forth but in the end we went with our gut. We knew it would always be easier to move to Barra than to move from there to the city. Not having a job and looking at the prospect of having lots of visitors, I wanted the convenience of being in the city where L and I could explore. We got lucky. Really lucky. We ended up finding a large apartment in the city near public transportation, a few blocks from the beach, and not far from the Lagoa. Given that it is on the second floor and the traffic is loud (really loud), we got a reasonable price for it. It has been perfect for visitors. However, after a couple weeks here my parents were curious as to what we might be missing out on not living in Barra. In Nebraska, people don’t really walk to the grocery store and after multiple trips per week to our corner stores, my mom wanted to see what the bigger stores were like. So one afternoon we headed out to Barra to take a tour of the area and hit one of the biggest grocery stores, Guanabara. I had only been there once after we had a long day at beach, but I remembered L loved it because they had a play area for kids where we could leave her while we shopped. L was thrilled that we were finally going back. I usually get overwhelmed with these kinds of places and when we got there I was immediately struck by how full it seemed. As we made our way up the ramps I noticed that carts seemed especially packed full of ridiculous amounts of one product. We checked L into the play area and realized we didn’t have a cart. My dad went to find one and I decided to start getting things on the list. That was when I entered the madness. I didn’t realize at the time but it was Guanabara’s anniversary sale. Of the 75 checkout lines, 70 were open and nearly all of them were 25 people deep. People were camped in lawn chairs watching over their three packed and chained together carts. It was at that point that I started feeling like I was going to hyperventilate. My dad still wasn’t back from cart stalking downstairs. I told my mom it wasn’t worth it. People were elbowing their way into new inventory as it came out onto the floor. L hadn’t yet finished her half hour play time so we intersected my dad as he came back from following people into the parking lot to score a grocery cart and suggested we get a coffee instead. A man from Western Nebraska with a deep appreciation for the open range, he didn’t disagree. It is hard to believe that exactly one month ago my parents arrived. The past month is a blur of circling the city, hanging out, playing in parks, visiting the sites, and sitting in traffic. L was completely spoiled by grandma and grandpa and I hope now to try to catch up on posting our adventures. Here is a picture from their arrival. So apparently if you write about Google they are watching. Well, not really, but I did find it odd that fifteen minutes after posting that Google maps failed me, I nearly ran over a Google map contraption. I now expect all discrepancies will be rectified. Paque Lage. Cappuccino. Work until battery runs out. When we found L’s daycare the 15 minute walk didn’t sound too bad. That is what happens when you search for apartments and schools in Rio’s winter, which isn’t only the coolest season, but also the driest. Needless to say, when we woke up to pouring rain and heavy winds on Wednesday, I was less enthused about walking or biking around the Lagoa. I got lucky. S was headed to work so he offered to drop her with the car on his way. That not only meant I got a drier morning, but also an extra 45 minutes to myself. Four hours later, the rain was still pouring down, but this time I didn’t have the option of hiding out. I decide stroller-less was the way to go. I packed up L’s rain gear and hiked over the hill. L was thrilled to see that our afternoon was going to include puddle jumping and umbrella carrying. While all the Cariocas were busy trying to get out of the rain, we made an adventure of it. We stopped for hot chocolate and coffee and then had to do bureaucratic errands before catching the metro home. I had high hopes of using a cool day to bake but by the time we got home we settled in front of the TV and cuddled through some dinosaur movie before swimming class. I have to admit, that I was probably one of the few people in the city to be thrilled by the weather. I miss fall and it felt good to slip into a pair of jeans and a t-shirt and even break out a scarf. I know what is around the corner: Heat. Heat. Heat. We had a taste of it last week and I decided that until I have to face it, I will take every cool day I can get. I’ve said that Chicago is a hard brunch act to follow, but that doesn’t keep us from trying. Last weekend when our friend was here we headed back out to Fort Copacabana. The view alone makes brunch worth it. 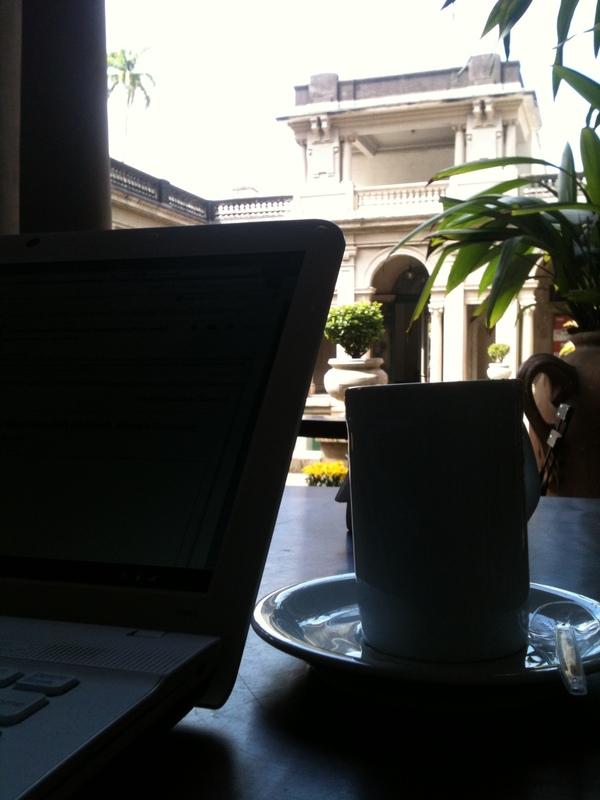 However, last time we went to Confeitaria Colombo I tried without success to order an unsweetened cappuccino. When I complained, the waiter explained that they did not add any sugar, that is just how the mix comes. The mix?!?! Needless to say I was curious about the other restaurant toward the end of the Fort, Cafe 18 do Forte. The tables always seem to be open when Colombo is full, but I suspected that this was because most people don’t realize there is another restaurant. More importantly, they have Segafredo cups, which means they must have an espresso machine. We arrived around 10 a.m. and were seated. We ordered an omelet, quiche and the breakfast for two (we were three adults and a toddler). The breakfast here includes bolinhas de chuva, Brazil’s version of doughnut holes, and are the best I have had yet. Our cappaccinos were still sweet, but not as sweet as at Colombo. I think there might still be hope for these. While we were waiting for the food to arrive, we actually ventured into the Fort. L was entertained by the tunnels and the secret rooms. There wasn’t much in terms of historical overviews but it was an interesting detour. 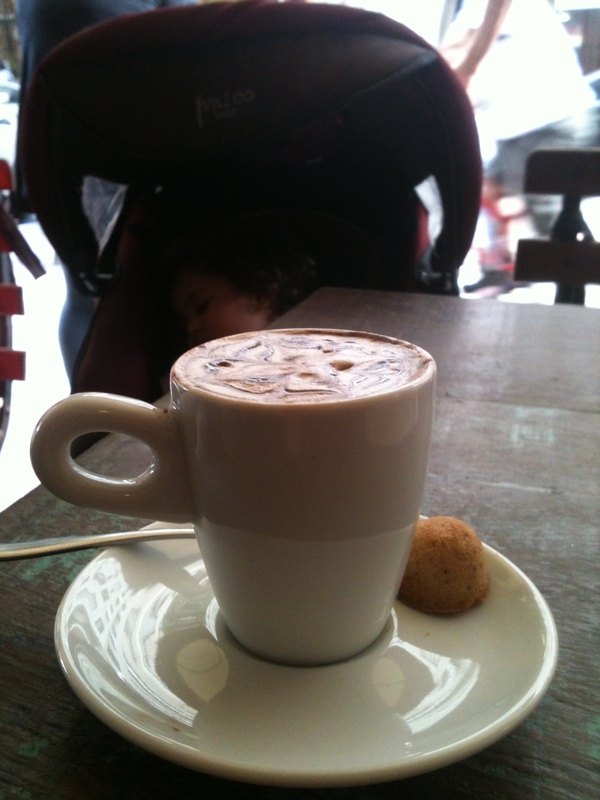 And this, for mamãe, this is the perfect nap.